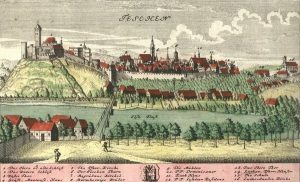 Cieszyn is the only Upper Silesian town where archival resources and library collections of public and private provenance, collected over centuries, have survived almost entirely intact. Comprising more than ten distinct historical collections, they contain over 900 linear metres of archive records, 18 000 inventory items of library manuscripts, 24 000 volumes of pre-1801 imprints and 150 000 volumes of 19th and 20th-century printed works. 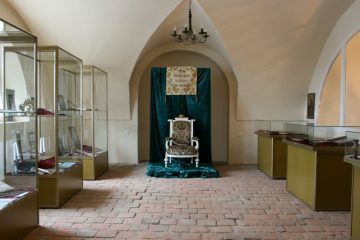 They include archival primary sources, library manuscripts and printed works from the region, as well as publications which, from the Middle Ages onward, found their way to Cieszyn Silesia from the whole of Europe, influencing the development of the region’s culture and shaping its character. They include works written in most European languages, linked to various national and religious groups, and representative of all ideological trends current in European culture. In terms of their provenance, their history as determined by centuries-old links to the region, and their contents, the collections – taken both as a group of collections and as an assemblage of individual items, often of universal value and uniqueness – not only represent the most important heritage of written culture in the region (on both sides of the Polish-Czech border) and the chief pool of primary sources for historical research, but are also an important element of European cultural heritage. 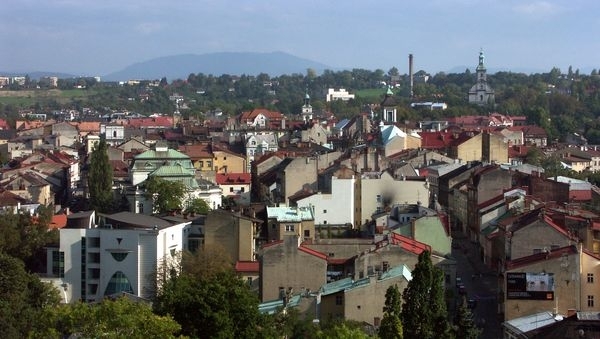 In addition, the collections give Cieszyn a special position in comparison with the rest of Upper Silesia, where either the continuity in the amassing of archive and library collections was interrupted, or collections of a similar kind were lost, or – as in the case of Katowice, the capital of the region – the collections only began to be created in the 20th century, by combining collections amassed in other regions. Copper-plate engraving based on a drawing by Friedrich Bernhard Werner, showing Cieszyn midway through the 18th century, published in Scenographia Urbium Silesiae, Nuremberg 1735. The building, which belonged to Gottllieba von Manteuffel and now houses Książnica Cieszyńska, is marked with a figure 4., the monastery of the Brothers Hospitallers of St. John of God with a figure 8., and the Church of Jesus, where the Tschammer Library was put, with a figure 16. W lewym dolnym rogu widoczna siedziba Książnicy Cieszyńskiej, w prawym górnym – kościół Jezusowy. 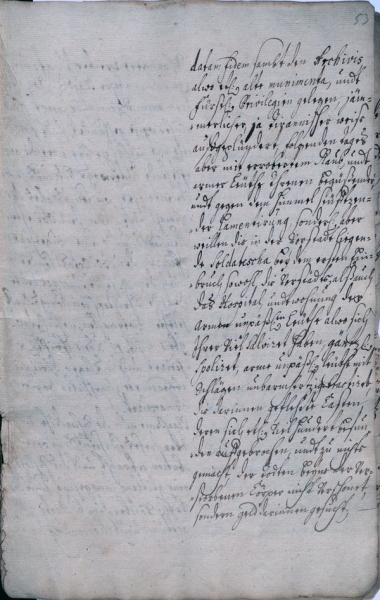 The copy from register made after the death of Cieszyn’s nobleman Jerzy Sobek from Kornice (+1649), lord of Rudzica, Landek and Ropica. It contains over 570 works including the collection left by the deceased. Large volume, allowing to put the book collection of Jerzy Sobek next to the largest contemporary court libraries in Silesia, adds to its importance if referred to the content of the collection, as the items included in the collection form the canon of contemporary European literature, both secular and religious, while equal rights were provided to publications of Lutheran, Calvinian, Catholic authors and even those following the doctrine of the so-called second reformation. Today, some of the books owned by Jerzy Sobek can be found in the Tschammer Libary. 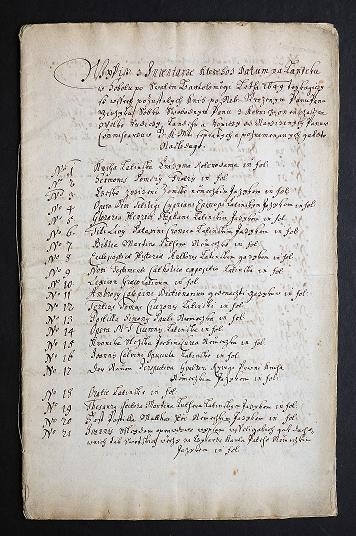 The prepared draft ordered by Cieszyn’s authorities with replies to the survey questions by the inhabitants of Silesian cities, made by Efraim Nason von Löwenfelß (+after 1680), teacher from Bolesławiec, jurist and historian who collected materials for his own monograph of Silesia that was never completed. 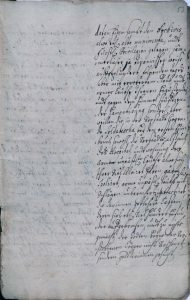 The draft contains replies to thirty questions related to the history of Cieszyn and various aspects of contemporary city life and as such is a sort of a “self–portrait” of Cieszyn 350 years ago. The reproduced page contains information about ravaging the city archives by the Swedes in 1645. 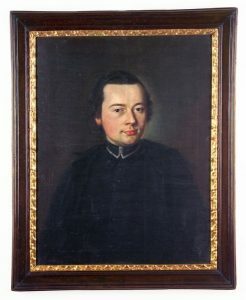 Priest Leopold Jan Szersznik (1747-1814), former Jesuit, was not only the founder of the public library and museum, but also a scholar who started regional research, a distinguished pedagogue and reformer of the education system and a local activist with rich merits for the development of Cieszyn in the 18th and 19th centuries. 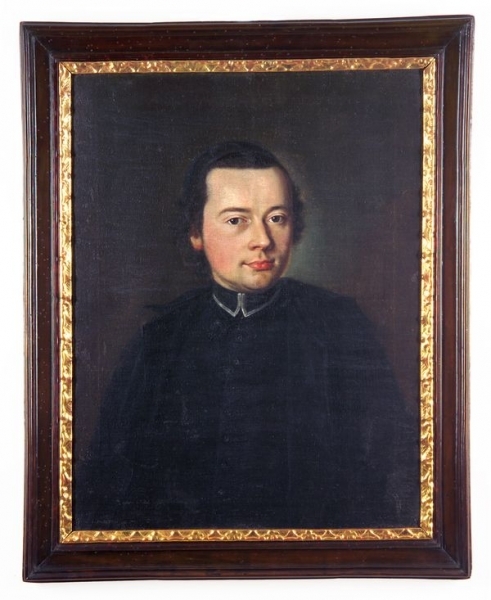 Its oldest portrait was probably made at the end of his studies in Prague, when – after winning the competition for the best research work on Slavic organized by “Societas Jablonoviana” in 1772 – L. J. Szersznik became known among the scholars of Prague. The library of Leopold J. Szersznik, opened in 1802 and soon later honored with the privilege of using the title “caesarean and royal” became the first public place of the type in the area of the Upper Silesia. Thanks to the forethought of the founder, who used hardly any other financial resources than his own to provide an adequate room, furniture, catalogues and records, and primarily protected its future existence by establishing a special foundation, the library has been preserved until today with the original arrangement, all content and old equipment. Currently, the library contains approx. 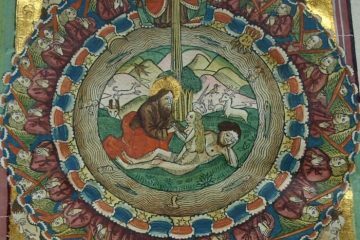 15 000 volumes of printed works, including more than 11 000 old prints, 39 incunabula and approx. 1000 manuscript units. 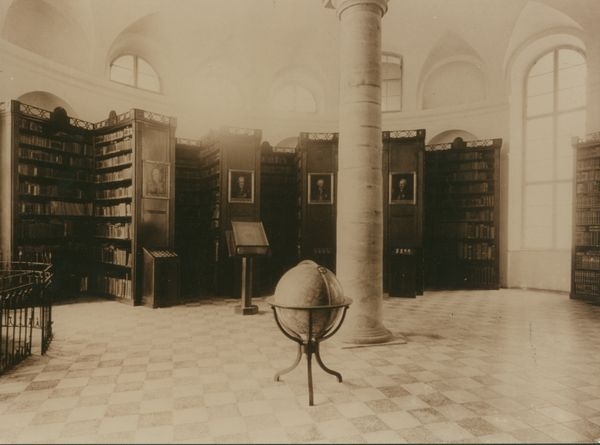 The photograph presents the inside of the library of Leopold Jan Szersznik in the former stable of the Larish family in Cieszyn, which was considered as one of the most beautiful library rooms in Poland in the thirties of the 20th century. 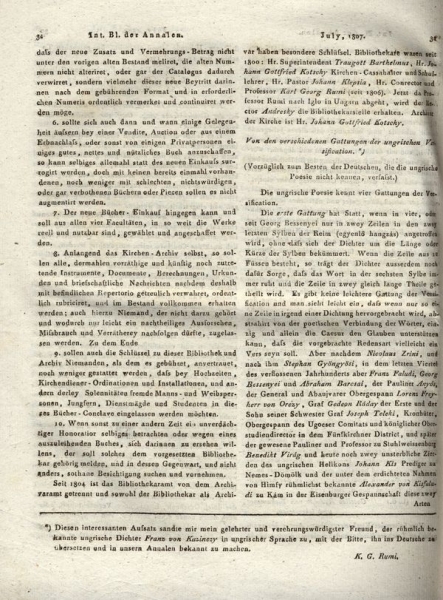 The article on the Tschammer Library by Karl Georg Rumi (1780-1847), a well-known Austrian scholar, at the time the deputy vice chancellor of the Evangelical Gymnasium in Cieszyn, published in a prestigious Vienna literature newspaper, was the first publication fully devoted to the library of Cieszyn. 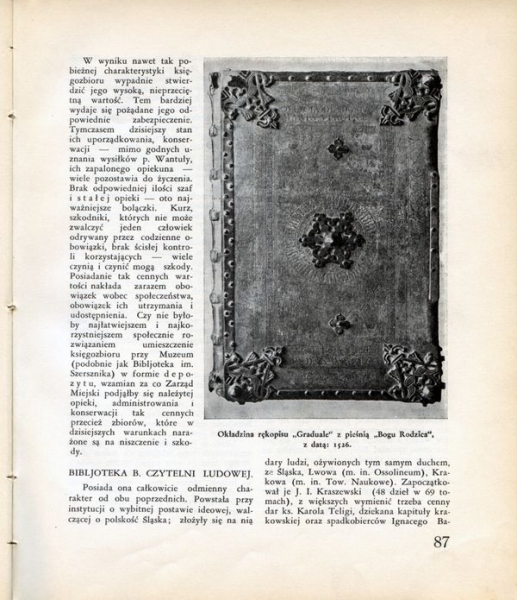 The article includes the will by Rudolf Bogumił Tschammer and the rules of library approved in 1799 obliging its keepers not only to catalog the collections on a regular bases but also take care of books technical condition, including full cleaning of books at least once a year. 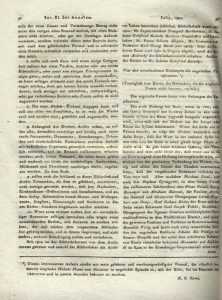 Two months after the publication of the article on the Tschammer Library, K. G. Rumi also wrote a short statement in “Intelligenzblatt der Annalen der Literatur” on the library of Leopold Jan Szersznik. The national movement in Cieszyn Silesia was started by a few sons of peasants, who studied in Cieszyn’s Evangelical Gymnasium. The Association of Polish Language Excellence founded by them in 1848 and referred to as the Polish Readers Room set the goal to popularize Polish literary language and Polish culture. 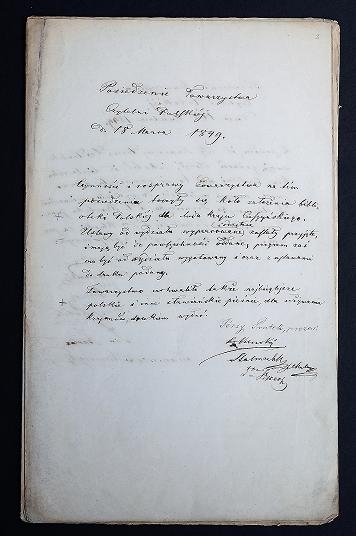 In the work of the Readers Room Association, an important role played the Polish Library for the People of Cieszyn County established on the 18th of March 1849, the first Polish public book collection in Cieszyn Silesia. Its owner was formally the “people of Cieszyn county between Ostrawica and Białka”. The Readers Room Association became the factory of proficient workers for all later cultural, educational, economic, social and political initiatives taken for the Polish community in Cieszyn Silesia. Its book collection, confiscated in 1855 based on the orders of the Austrian authorities and revindicated by the Peoples Reading Room established in 1861, is currently a part of the collections of Cieszyn Historical Library, to which a significant part of the archives of the Association of Polish Language Excellence was brought as well. 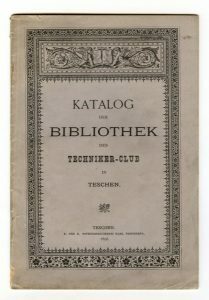 Already in the 19th century, a few Cieszyn’s library collections had their own printed catalogues. Most of them were school libraries, however, realization of similar initiatives was made by social organizations as well. The presented catalogue refers to the library of the Technicians’ Club formed in 1874, one of the first associations of the technical intelligence class in the area of Austria-Hungary. 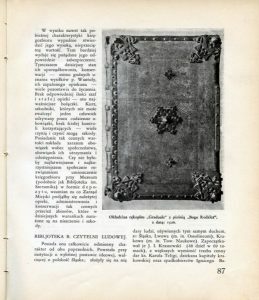 In the article, which is the aftermath of the scientific reconnaissance performed in the thirties of the 20th century in Cieszyn libraries by Alodia Kawecka-Gryczowa (1903-1990), one of the most renowned Polish literature and book collection experts, we can read about: The city, in which care about the aesthetics and culture of daily life can be seen by every new visitor, will definitely take care of the improvement of intellectual development with the help of specialized libraries and shall not allow to waste the valuable capital of books under its management. The Merciful Brothers’ Order called Bonifraters was founded by a Portuguese Saint, John of God, who lived in the 16th century and is considered the pioneer of contemporary hospitalizing. 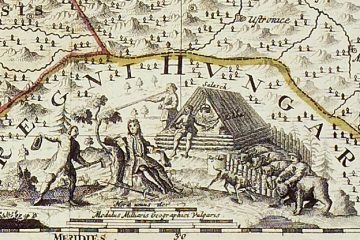 The collections of the Department of Maps in the Museum of Cieszyn include the oldest (1724) map of the Duchy of Cieszyn with Latin text serving as a regional advertisement of that time. “A Witch Named, or a Short Lesson and Warning from Witches” is the title of a short discourse being a part of the collection of Józef Ignacy Kraszewski kept in Cieszyn’s Historical Library. 19Imperial Eagle ornamentation on Ludwig Zinzendorf’s walking stick, Postilla of Priest Samuel Dambrowski, portrait of Philip Melanchthon… These items conceal many secrets and revealing them changes our perception of the world. 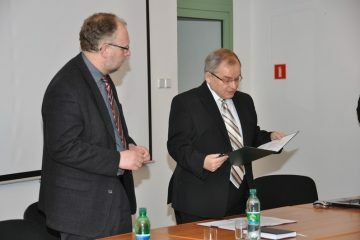 On the 23rd of January 2009, an agreement was concluded in the seat of Książnica Cieszyńska, based on which Książnica Cieszyńska joined the group of institutions that developed the Silesian Digital Library. Cieszyn’s Historical Library bought seven professional air humidifiers. The equipment will be operated in restorer’s workshop rooms and collection storage rooms. On the 12th of January 2009, the State Archives in Katowice concluded a contract with “Mikrofilm-Center, Digital – Center” company based in Poznań for services covering microfilming of the archived collections. The project of “Protection and preservation of Cieszyn’s writing heritage” included restoration of the Map of Czech Kingdom owned by the Museum of Cieszyn Silesia. 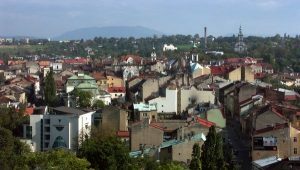 Within Cieszyn’s Historical Library participation in the project of “Protection and preservation of Cieszyn’s writing heritage”, the system of monitoring conditions of historical collection storage and access was upgraded. 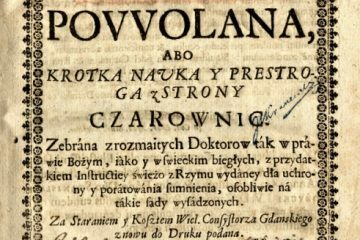 The project of “Protection and preservation of Cieszyn’s writing heritage” includes not only conservation and protection of collections, but also promotion and providing access to a wider range of readers. Within the delivery of equipment for the restoring workshop room of Cieszyn’s Historical Library, a new roll laminator was purchased in September 2008. Canon MS 300 II scanner was purchased on the 23rd of September 2008 as a part of the project of “Protection and preservation of Cieszyn’s writing heritage”. Disinfection of Historical Library collection is performed in Konvac fumigation chamber purchased for PLN 311 100.